The Ascendancy expansion gave us alot build potentials and I want to provide a build, that got heavily buffed with this expansion. RF Totems is for sure the new FOTM build, but also the selfcast RF in combination with a damage spell has a huge potential nowadays. Basically the Elemental Focus gem provides us 50% MORE damage without a downside in our case, since flame surge can't ignite anyway and RF can't inflict elemental status ailments, since it is a degen effect. The new ascendancy class provides alot more survivability, since we got a fair amount of bonus health regen, alot more strength and 1% life leech. Flame Surge fits perfectly for a melee caster build. It's range is quite equal to the range of RF. The huge advantage of Flame Surge is 50% MORE damage vs burning enemies. Since RF keeps enemies burning the synergy between these two spells is just awesome. Furthermore Flame Surge got one of the highest base DPS values and provides a huge single target DPS, while RF can clear large packs in a decent amount of time, so we got a nice synergy between single target DPS and AoE DPS. At the moment i'm using a 6L with a Lvl 19 Flame Surge, as you can see in the image. My Gems have 0% quality atm and i'm missing some nodes in the skill tree due to my level. So the stats are quite abit away from the maximum. 80k+ DPS on Flame Surge seems totally realistic here with decent gear. Furthermore the 50% MORE damage against burning enemies is not calculated in the tooltip, so the real DPS is way higher. -If you want more survivability, you can use Flame Surge in the weapon-4L and use Kaom's Heart as Chest. This is not that much DPS difference, since Doon Cuebiyani provides Weapon Links with a lvl 30 Iron Will. Nice, I'll give this build a try in Perandus HC! Do you rely on FS crits in any way for damage? You have no crit chance nodes that I can see, which means you have the base 6% chance. 1. Controlled Destruction, 44% MORE damage to FS instead of conc effect would forego 13% MORE damage for the benefit of much larger AoE, maybe it's something to think about? Its decrease in crit is nothing since hits are lower bound capped at 5% so you'll effectively loose 1% crit chance without any other increases. 2. Elemental Overload, 2 points of in the three, gives 40% MORE ele damage for 8 seconds, affecting both RF and FS. All you need to do is crit once every 8th second, which 5% FS with echo easily does, or just a 1 socket Ice Spear or 2 socket with inc crit strikes. I don't rely on crit at all. Basically tankiness stands beyond damage in any way in my build. A melee caster needs that many survivability, so i doubt there would be any possibility to include a decent amount of crit, without losing survivability and "just a little bit" of crit is not really an option in my opinion. the point here is that I actually dont see any difference in wideness and range, when using conc effect. I tested the skill with and without conc and it really felt the same. And since conc effect gives higher values than Controlled Destruction (59% more compared to 44% more) i was going with conc. You can also go with conc and Controlled Destruction if you can manage to get 306 int to use repentance. That would free up the iron will spot to use both spells. On the downside, you'll have to use astramentis to get that much int, which will result in a loss of survivability, since neither repentance nor astramentis give flat HP. could go to the increased skill effect duration nodes near shaper and level with firestorm. maybe take some additional damage nodes from the templar area, since with tank nodes only leveling will be slow as hell. 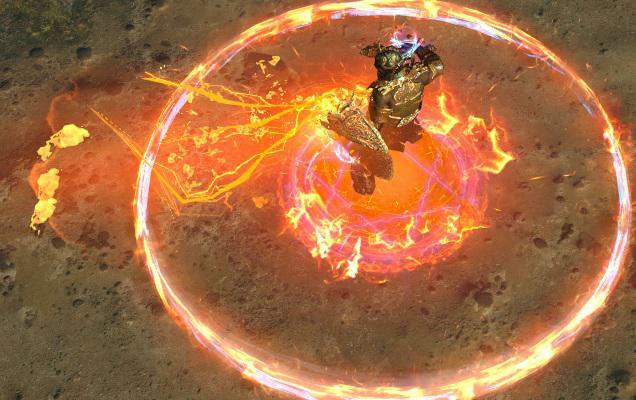 if you can afford tabula + elreon-rings incinerate would be possibly the best spec, since it doesn't need mana with good elreon-rings at low level and incinerate doesn't need that much damage nodes to get a quite decent leveling DPS. totems might also work for leveling, didn't tried them. Really like the build and I've been wanting to do a Flamesurge RF character for ages so I decided to try it for this league. My only issue with your tree is wouldn't getting explosive impact for 55% inc fire and 5% radius be better than 70% inc burning from holy fire? As far as I know inc fire will affect both RF and flamesurge while inc burning only affects RF. this is actually a pathing thing. i might want to go to the +1 curse cycle and/or to sovereignty (reduced mana reserved), which is pretty close to the burning cycle. in general the fire cycle provides better bonuses, but you are further away from the nodes i mentioned. actually I'm not sure if the cycle is worth taking at all (neither the burning, nor the fire damage cycle). mental rapidity might be a good option aswell. - removed burning damage cycle near avatar of fire and changed pathing a bit to include max life/chaos resist cycle (Purity of Flesh). updated my current stats with the linked gear on level 88.